The Convention of Biological Biodiversity was extended to Hong Kong in 2011 and Hong Kong government has adopted a participatory approach to formulate a Biodiversity Strategy and Action Plan. Over 10 WWF experts have been involved in the three-tiers consultative body to discuss strategy and actions and provide conservation recommendations. During the public consultation period in early 2016, we gave a number of talks to a wide audience to arouse their interests, and to help them to understand the biodiversity value and actions needed. 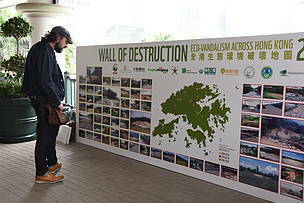 Together with other green groups, we also put together a Wall of Destruction exhibition to show the destruction cases in our countryside in the last 10 years. We also launched an online petition to help people to submit their views and over 1,600 people used our platform. Click here to read more on WWF-Hong Kong submission to BSAP.